Breaking the previous record price for a Melbourne apartment, developer GURNER this week sold a $30 million luxury penthouse at its new development Saint Moritz in St Kilda. The 6-star apartment development promises to be one of Australia's most exclusive and opulent addresses, with on-site amenities that exceed the standards of the top-end luxury hotels. The price is 20 per cent higher than the previous Melbourne record and is surpassed only by the $40m record price achieved for an apartment in Sydney. The double-storey penthouse has earnt its price tag. With over 650 sqm of internal space, it comprises seven bedrooms, a seven-car private garage with direct lift access, four living rooms, an in-home sauna, gymnasium, and two private pools — one of which submerges into the room below with transparent glass allowing views into the room. 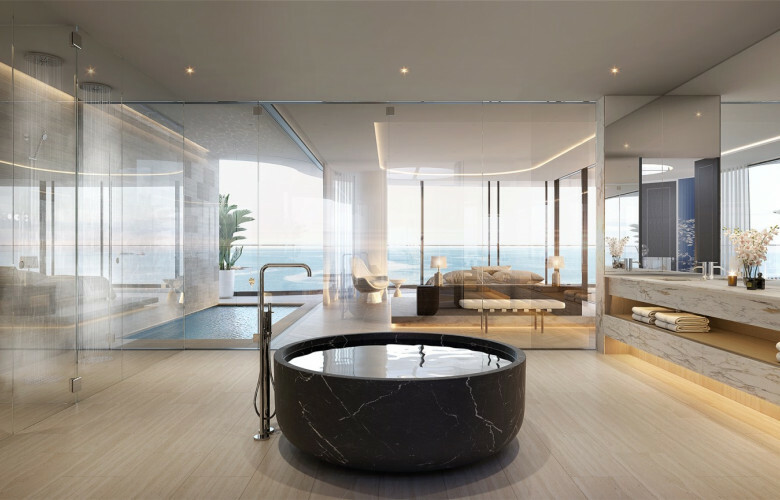 A cascading water feature, flanked by marble-clad walls, connects the two floors while a solid Nero Marquina bathtub is perfectly placed to achieve 180-degree water views across the bay. Add to all of this the addition of a temperature controlled wine cellar which can fit up to 1,000 bottles, and it’s clear why this property has raised the bar for luxury inclusions. “We had no intention of selling the prized penthouse until the launch,” says Tim Gurner, founder and director of GURNER, “but once word got out we were swamped with interested buyer parties — all local Melbourne identities who quickly realised this will be Melbourne's — and arguably Australia’s — best residential address. Off the back of this successful transaction, Tim says the company is designing another penthouse in the second building that will be priced somewhere between $25 million and $30 million. This new addition will form part of the Penthouse Collection at Saint Moritz. The development is placed just moments from the beach, and Melbourne’s best boulevard starts at the end of the driveway. With vibrant St Kilda as its backyard, Saint Moritz places residents in the centre of the action. The project is currently taking registrations of interest with sales to launch officially in mid-2019.